Checking out the @RootsTechConf live streaming schedule for later this week. I’m ready to be #NotAtRootsTech. Today’s a great day to access genealogy instructional videos through NARA’s virtual genealogy fair. If you can’t join the sessions live, the recordings to this year’s sessions will be available through the YouTube channel. 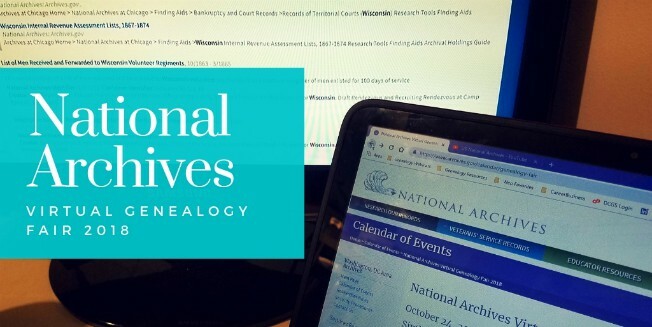 If you can’t get enough information, check out the recordings from previous five years of Virtual Genealogy Fairs. Brew some coffee. Charge your device. Flip to a clean notebook page. Test that your pen has ink. RootsTech will be live streaming 19 session over 4 days, February 28 to March 3. Lucky me. I thought RootsTech was early in February. I thought I had missed it as I repeatedly shoveled my Midwestern snow covered driveway. I didn’t miss a second. RootsTech 2018 is at the begining of March instead of February. I’m looking forward to the DNA sessions and hearing Scott Hamilton speak. I’ve been impressed by him even since watching his amazing footwork on Olympic ice. Helping people tell their stories has always been a passion of mine. I’ve been doing this for years as a career advisor to alumni from the University of Illinois. But, those stories focused on the world of work and my clients’ professional lives. I’m intrigued by the research questions that arise within family history and wish to dive into these questions more deeply. The John T. Humphrey Scholarship will help me achieve these goals. 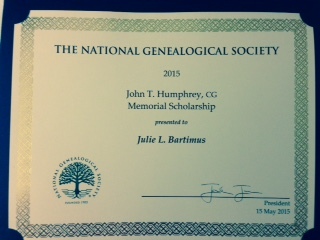 The American Genealogical Studies courses would firm-up the foundation of the education that I have already built, fill in gaps, and provide the recommended structure for citing and reporting on the information I collect. While I could only attend this one day of the #NGS2015GEN conference, I packed it full. I was so excited about all the things that I would learn and the people that I would meet. I’ll need to process the amazing amount of information and review my notes, but here is a review of the topics. 7 pm – NGS Banquet John P. Colletta will entertain us with this burning question: Why Great-Grandpa Shaved Off His Mustache: Tales of Our Ancestors and the Weather. Stories of winter through the centuries and across the country illustrate how weather affected our ancestors’ lives.